One day I was selling software development services to an IBM language development lab. The lab manager was very direct. He dispensed with the normal pleasantries and cut to the chase: "What's your average APAR/kloc?" he asked. I didn't know the answer. I didn't even know what an APAR1 was. I knew I'd better find out - quick. On that day I learned what quality assurance means. All the guy wanted was confidence; confidence that we could produce quality software and he wasn't interested in my personal assurances, he wanted it by the numbers: in APARs/kloc. 1An APAR (authorized program analysis report) is a term used in IBM for a description of a problem with an IBM program that is formally tracked until a solution is provided. Can you quote your software development shop's average APARs/kloc? More generally do you know what gives your customers confidence? Do you know what they want; what they perceive to be quality? Do you have a process for delivering quality reliably, predictably and for ever? This is the essence of the quality management discipline. If you can't answer these questions you can't have a business, at least not one with any life expectancy. At CA we believe our job is to help you answer these questions and to prosper from it. 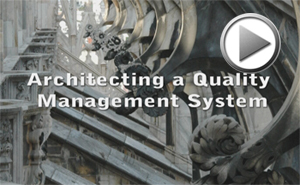 Quality management system development. CA assists management in formulating quality policy, developing quality manuals and quality assurance and control procedures. Methodology development. CA either creates system development methodologies or assists organisations in tailoring their existing processes. Working from our extensive library of best practices we never start with a blank page. Process improvement. CA assesses existing development processes and provides recommendations for improvement. Audit. CA performs project audits against international standards such as ISO 9001, EN 50126, EN 50128 and IEC 61508. Quality training. CA provides formal training in software quality management. (Network Provisioning) CA provided the Quality Manager for the $50 million NPAMS telecommunications network provisioning software project. (High Speed Rail) CA provided the Quality Manager for the development of underground railway station environmental control and smoke extraction systems. (Railway Signalling) The Synergy is an alliance between Ansaldo, The United Group and Queensland Rail Ltd. Synergy performed railway signalling projects for Queensland Rail Ltd. CA developed Quality Management procedures for Ansaldo and a complete signalling project life cycle methodology for Synergy. As part of this project CA analysed the structure of a generic methodology as described in international standards and developed an innovative software product for synthesizing, presenting and maintaining systems development methodologies using database technology. (Nuclear Reactor Control) Foxboro in partnership with General Electric was developing a control system to perform nuclear reactor shut down. This was the ultimate safety critical system development as mission failure could result in a nuclear reactor meltdown. CA's task was to review Foxboro's firmware development processes and to upgrade its development methodology to comply with the US Nuclear Regulatory Commission's standard for nuclear quality assurance (NQA-1). CA analysed the requirements of all standards called out in the development contract and created a compliant, nuclear grade, systems development methodology.